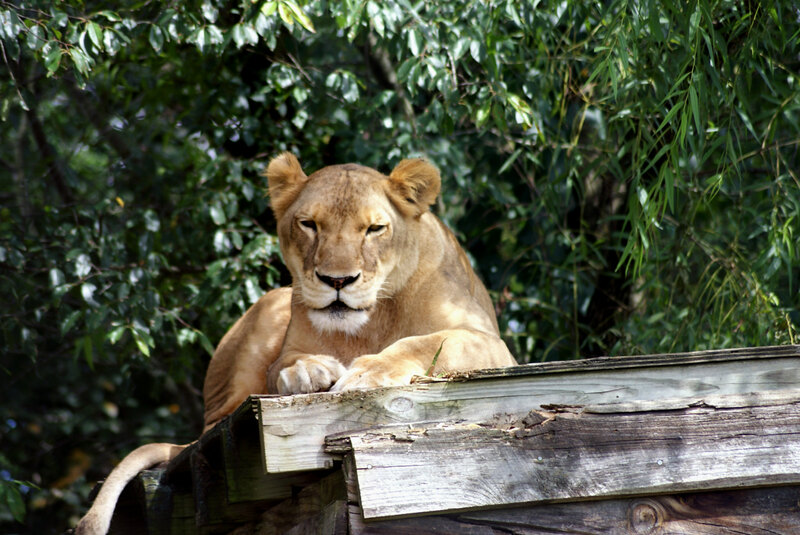 Roman and Reina Lions joined the Carolina Tiger Rescue Family in June 2012. Roman (Right) and Reina (Left) Lions were formerly housed at a rescue in Ohio. After a 2011 incident in Zanesville, Ohio, when a man released 56 dangerous, wild animals that had to be killed in order to protect the public, Ohio enacted stricter laws around owning wild animals. As a result, the facility could not keep up with the new legislation and continue to financially support its animals. Taking care of these cats is a huge responsibility. At Carolina Tiger Rescue, it costs $80,000 a year just to feed the animals. Roman and Reina’s former home wasn’t considered a true sanctuary, because the owner purchased animals. Carolina Tiger Rescue is the only sanctuary in the state of NC that fits the definition of a federally-defined sanctuary. Roman and Reina follow the traditional roles of lions. Around the sanctuary, Roman is the boss. He eats first, as male lions do in the wild. 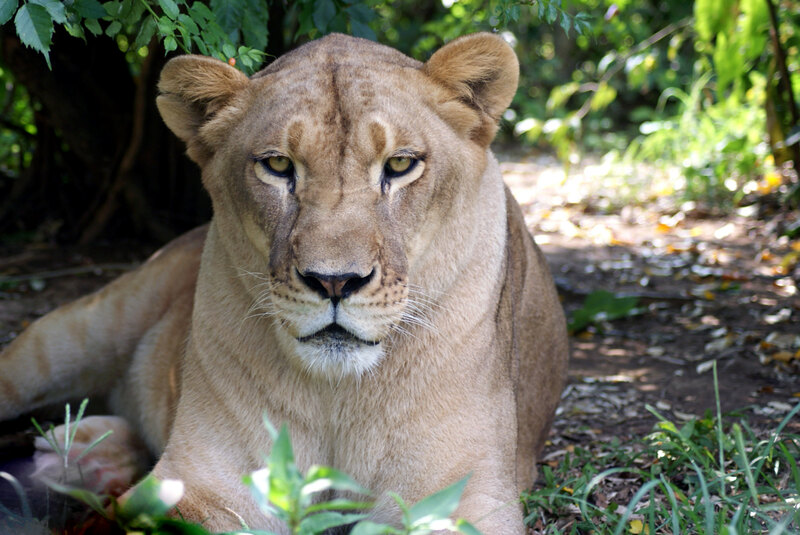 Reina keeps a close eye on her surroundings with an unbreakable focus, tapping into the watchful female lion role. Lions are the only social cats. They live in family groups called prides which can include as many as 40 lions! The males protect the territory while the females do most of the hunting. 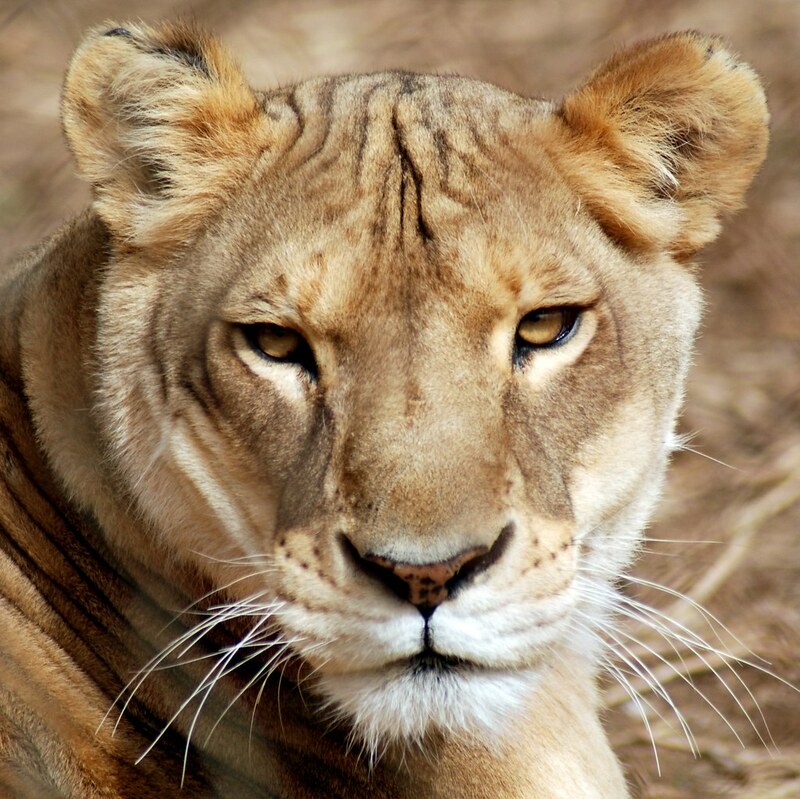 There is a visual difference between male and female lions because the cats are sexually dimorphic. Only males have manes around their necks. Lions are very lazy. In the wild, lions will sleep up to 20 hours a day! Sheba and Sebastion Lions joined the Carolina Tiger Rescue family in November 2010. Both Sheba (Left) and Sebastian (Right) were used for entertainment purposes. Sebastian was chained and used as a prop in a haunted house in Texas. This haunted house also contained tigers, bears and wolves. Sheba was a pay-to-play cub that was walked along Mexican beaches on a leash until she was about 6 months old and became too much to handle. She was rescued and sent to Texas’s Wild Animal Orphanage, which shut down in 2010. The life of animals used for entertainment is very stressful and often short. As cubs, they are taken from their mother within hours of birth, so the mother will go back into heat and produce another litter that can be exploited. Even a cub can unintentionally hurt a person with their sharp claws and teeth. They are often underfed to keep them small and eager to eat when people pay to bottle feed them, and they’re often sedated so they won’t be too playful. Sebastian is the largest animal at the sanctuary at a whopping 600 pounds. Despite his size, he lets Sheba boss him around. Sebastian lacks a mane due to being neutered. 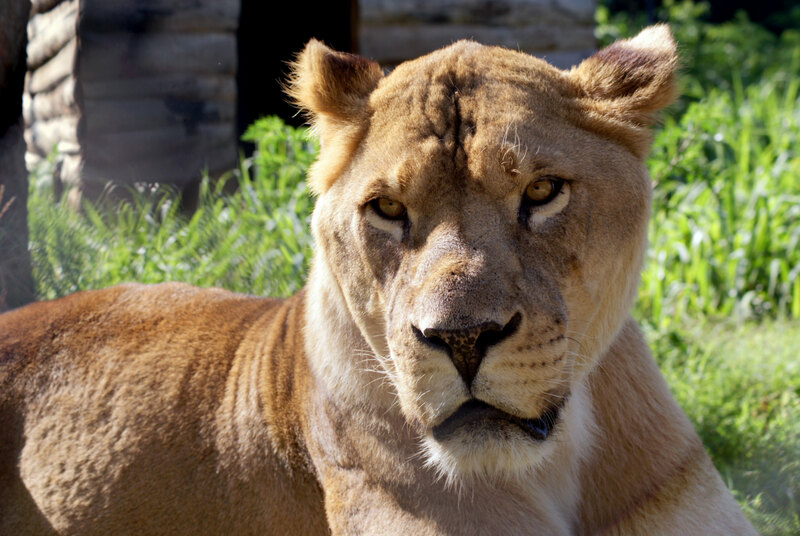 Sheba is food aggressive and patrols the pride’s territory but will also show affection to Sebastian by laying with him in the den box, rubbing heads with him and grooming him. Avoiding places that exploit the animals for entertainment purposes and money. Not patronizing movies or watching TV shows that use real lions in their films. Not patronizing places that allow direct contact with lions or their cubs. 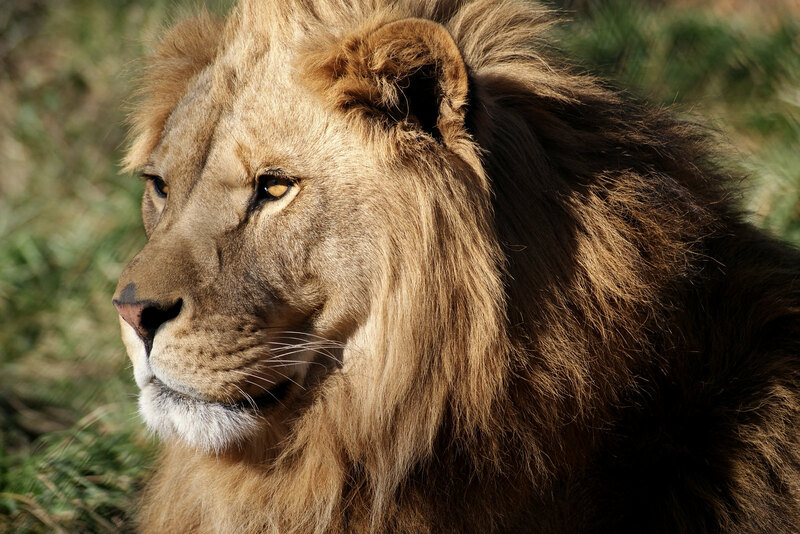 Supporting organizations that are committed to saving and protecting lions in captivity. Not supporting companies that allow, aid in, or promote trophy hunting. Not participating in canned hunting. Supporting organizations aiming to help protect wild lions and their habitats.